Doc Mock’s Halloween Special Now Online! Doc Mock’s Big Halloween Episode with special guests Count Dracula & Frankenstein’s Monster is now archived online for you to enjoy! 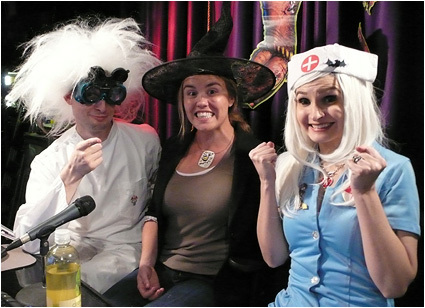 Here are the links to this 3-part Halloween extravaganza episode chock full o’ horrific costumes, creatures and more! Count Dracula Appearing LIVE On Doc Mock Tonight, Thursday @10pm PST! Again, tonight is our final Halloween episode, so you’ll definitely wanna check this one out LIVE! Hope to see you guys there in the chat rooms! Don’t forget, we have our FINAL Halloween episode of the season coming up this week on a different day! That’s right, this week our episode is airing on Thursday, October 29th LIVE at 10pm PST with special our guest, the one and only DRACULA! We have loads of Halloween surprises in store for you, so you do NOT want to miss out on this one! Be sure to catch us when it airs LIVE! Also, time’s running out to enter our special Halloween Art Contest for Doc Mock’s Movie Mausoleum and you don’t even have to be a real artist to participate! All of the entries we receive will be aired during our final Halloween episode on Thursday, October 29th. Click here to learn how you can enter! In case you missed it, our Halloween episode from last with with Keith Apicary of “Talking Classics” is now online! Episode 15 With Keith Apicary Of “Talking Classics” Now Online For Your Viewing Pleasure! Ever wonder what it would be like if an arcade game not only took your quarters, but also took your soul? Sure you have! And that’s why you need to watch our latest episode from last week! 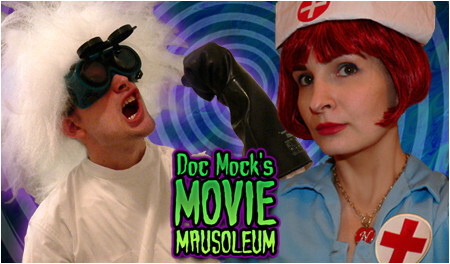 Yes indeedy, Episode 15 of Doc Mock’s Movie Mausoleum is now permanently archived online for your viewing pleasure! 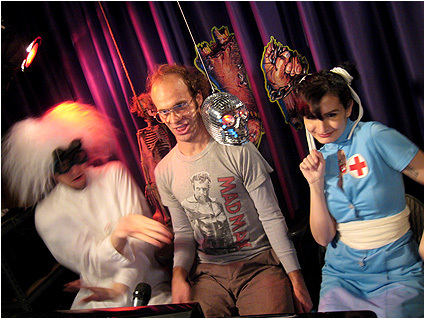 Big thanks again to our special guest Keith Apicary of the popular video game comedy series “Talking Classics” for joining in all of the arcade assassinations of episode fifteen and sticking around in the chat room with us for some dancing and other Halloween season antics afterwards! We even surprised Keith (and the world!) with his first Neo Geo AES home console video gaming experience! In addition to the episode being up online, we’re currently holding a special Halloween Art Contest for Doc Mock’s Movie Mausoleum and you don’t even have to be a real artist to enter! All of the entries we receive will be aired during our final Halloween episode on Thursday, October 29th. Click here to learn how you can enter! 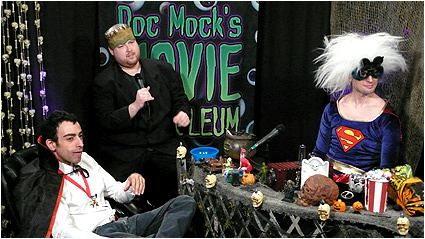 Watch Keith Apicary LIVE On Doc Mock’s Movie Mausoleum Tonight @10pm PST! Again, tonight is another of our Halloween episodes, so you’ll definitely wanna check this one out LIVE! Hope to see you guys there in the chat rooms! Ever wonder what it would be like if an alien, who had the most stereotypical Italian accent for no reason whatsoever, was mankind’s only hope against a ferocious beast that hates model replicas of buildings and trains? Sure you have! And that’s why you need to watch our latest episode from last week! Yes indeedy, Episode 14 of Doc Mock’s Movie Mausoleum is now permanently archived online for your viewing pleasure! Big thanks again to our special guest Cissy Fenwick for joining in all of the choo-choo trampling terrors of episode fourteen and sticking around in the chat room with us for some dancing and other antics afterwards! 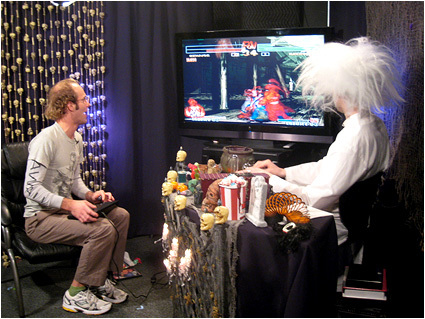 And don’t forget, we have another fun Halloween episode coming up this Friday, October 23rd LIVE at 10pm PST with special guest Keith Apicary from Talking Classics! Doc Mock’s Halloween Art Contest! Another LIVE Halloween Doc Mock Episode Starts Tonight @10pm PST! Don’t Miss It! BTW, we’re also going to be doing an all-night charity fundraiser on theStream after the show is over, so be sure to stick around for all the antics that will be taking place during that time! Ever wonder what it would be like if Jaws was the least of your worries ? Sure you have! And that’s why you need to watch our latest episode from last week! 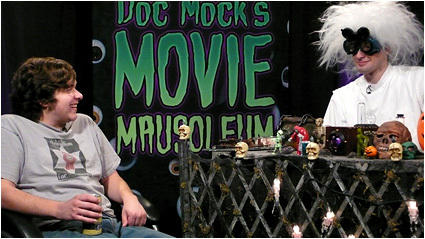 Yes indeedy, Episode 13 of Doc Mock’s Movie Mausoleum is now permanently archived online for your viewing pleasure! Big thanks again to our special guest Josh Simpson for joining in all of the beach bum bombardments of episode thirteen and sticking around in the chat room with us for some dancing and other antics afterwards! Halloween On Doc Mock’s Movie Mausoleum Starts Tonight LIVE @10pm PST! Don’t Miss It! Again, tonight is the start of our Halloween episodes, so you’ll definitely wanna check this one out LIVE! Hope to see you guys there in the chat rooms!